Contrary to a lot of my fellow Midwesterners, however, I begin to think of far-off destinations in the colder regions: Alaska, Antarctica and Greenland. That could be because my body temperature is already set for the northern climes; I’m comfortable in boots and parkas. And, besides, I tell myself, I already have the proper clothing. So, when I had the opportunity to travel to the Galapagos Islands earlier this year, I was excited—but not quite convinced it was a place I would have chosen if I could have picked a spot anywhere in the world. It turned out, however, that the location chosen for me couldn’t have been more apt or meaningful. Those of us who travel often find out that there is no better way to prove yourself, to test your most fondly held beliefs and to discover which issues mean the most to you than by stepping outside your normal routine and comfort zone. 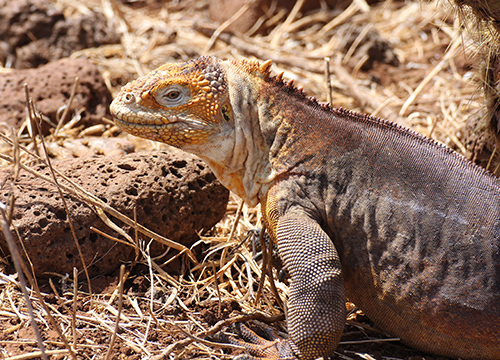 Before I left home, I knew that the Galapagos and Ecuador were going to be hot; after all, we would be crossing the Equator four times in our weeklong tour. And prior to leaving, I read about the challenges the islands face; about the invasive plant, animal and insect species; the ever-increasing population; overfishing in the marine reserve; and the burgeoning tourist numbers. 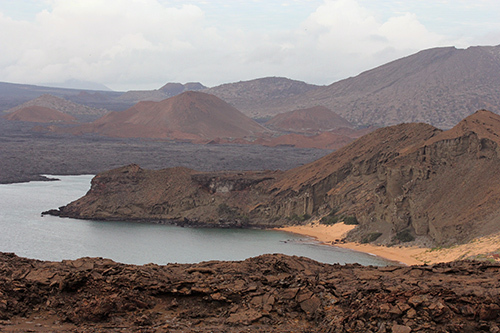 But environmental threats such as those didn’t have an immediate meaning for me until my small group of about 20 travelers was on Bartolome Island, a place where the landscape is more accurately described as a moonscape. Among the volcanic cones and lava tubes, I easily envisioned standing on planet Earth when it was new, before beings like me were even an idea. And while at home I could appreciate from reading articles how important it is not to let our World Heritage sites get overrun with too many tourists at one time, the issue became personal for me when I worried about whether our tiny group—now at the top of an uphill trail—would run into that larger one just disembarking from a bigger ship down at the base. 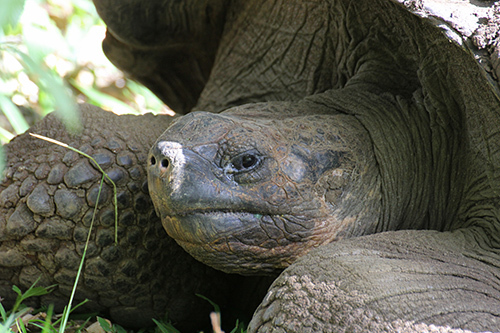 Of course, the highlight for most visitors to the Galapagos is seeing the giant tortoises. Photos and stories about them are published around the world. But when you get to the islands and discover that the best opportunity to see them (without having to scale a volcano) is to go to a preserve, it becomes even clearer how much the islands have already lost due to human presence. For a cold-set person like me, though, I will admit that I found the Galapagos sun unrelenting. I had brought along my Wisconsin “summer clothes,” which basically consist of lighter, long-sleeved shirts and three-quarter-length pants, rather than my usual down-to-the-ankle jeans. The big surprise was that I turned out to be the smartest packer. Many of my fellow travelers commented that they had brought along sleeveless shirts and shorts only to find they couldn’t wear them due to the intensity of the sun. It seems I had blundered my way into being the group’s savviest island traveler. In spite of that, I did get a remarkable “Teva-tan” on my ankles and feet—the sections of my lower limbs that my pants failed to cover and that showed through the straps of my sandals. Those parts ended up with a ruby-red burn, but I felt it was a small price to pay for the natural wonders I was seeing: birds that don’t fly away when I approach, sea lions who come up to greet me and iguanas that I swear posed and smiled for my camera. 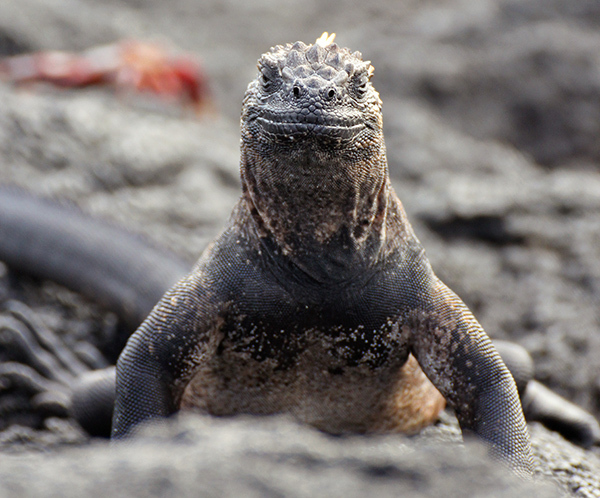 My experience in the Galapagos has made me think that sometimes when choosing a next travel destination, playing “opposites” will bring you the most reward. Think of where you most want to go, then go to the opposing corner of the globe: in temperature, latitude and culture. I now know that it makes for an eye-opening and life-changing journey. In one day, I had left the sun of Ecuador behind and was back in the Midwest. We’d had a snowstorm while I was gone, and it was time to start up the snow blower. Talk about culture shock. But this time as I pulled that engine’s cord, I somehow felt different. I wondered what the temperature was like at the Equator at that moment; were too many tourists stepping upon Bartolome? Were the small tortoises I saw growing up at the Charles Darwin Research Station thriving; were they being carefully watched at this second so that no harm came to them—that they could one day be returned to their native islands to repopulate them? And, isn’t it amazing, I thought, that right now, under the thickness of my snow pants and inside my Gore-Tex boots lurks the hard-earned tingle of sunburn and peeling skin. Have you ever traveled to a place that was “opposite” to where you dreamed of going? I’d love to see Churchill or Antarctica. Those would be contrary to my internal thermostat. Candy, what an interesting article. You capture your experiences and feelings so well that everyone wants to travel wherever you go! Since I love the warm climate so much, I never dreamed that Alaska would be my favorite place to go. Every time I have the opportunity to go, I fall in love with it all over again. Never in my life did I think I would go to Easter Island, the land of stone giants, but thanks to a magazine assignment, I did just that in 2004. Most people fly to the tiny island on LAN airlines and stay for 3 days on their way to Chile or Tahiti. After all, there’s not that much there, is there? Once you’ve seen the stone heads, that’s it, right? I stayed for 10 days to cover the story of a university professor who takes a class of archaeology students there each July/August for 6 weeks. That gave me the chance to not only see the archaeological wonders of the island, but also to get to know the people, the culture, the history. Nothing can be better than when we take time to really get to know a place. It was the most amazing trip I’ve ever taken and will ever take, I’m sure of that. I have just a few images online at http://jennifercrites.photoshelter.com/gallery/Easter-Island/G0000rM6JVCJ.c1g/, with many more to come in the near future. Galgapagos are on my list for sure! I wonder how all these “tourists” affect the habitat of these fragile locations.